Yesterday, I turned 23 years old. Another year older, another year wiser…is that how the old saying goes? Something like that. 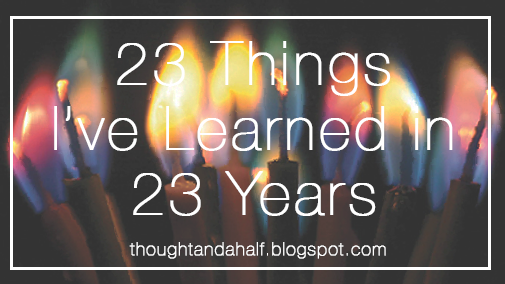 Anyway, I haven’t learned much in my 23 short years, but I’ve learned enough to make it to this point. At least people can stop singing Taylor Swift to me now. People will hurt you. Learn something from it, no matter how small. Busy work exists outside of high school. Speaking of high school, the instant you set foot onto your college campus, no one could give two rats’ behinds about what you did in high school. You don’t have to know exactly what you want to do with your life when you get to college. It’s okay to change your mind if you find another possibility or interest. Learn to use a crockpot, and use it often. There are people who will try to put you down to make themselves feel better. Forget those people. You don’t need that negativity in your life. You’re not better than or above others just because you’ve seen more of the world than they have. Handwritten thank-you notes–and letters in general–go a long way. Send one whenever you can. If your parents and/or friends tell you that you’re in a toxic, dangerous relationship and to get out of it, listen to them and get out. Now. Read something every single day, whether it’s a magazine article, a tidbit in a newspaper (props to you for reading an actual newspaper), a blog post, a novel, or a chapter of said novel. Have a go-to choice for wine, beer, and/or mixed drink for going out. It makes the nights easier and more expedient, and fellow bar-goers won’t hate you for taking forever to order. Related: the same concept applies to Starbucks. Have at least one meal that you can cook confidently, that you’d be proud to bring to a dinner party and claim as yours. Pick your battles. Most aren’t worth it. Know which ones are, and save your breath and effort for those. Hope they’re few and far between. Play a sport and do something artsy, like art or music or dance. The former will keep you in shape and teach you sportsmanship and how to play on a team. The latter will teach you how to take criticism. Both will teach you patience, perseverance, and the importance of practice. Don’t be afraid of change. It’s good for you sometimes. More importantly, be able to adapt to it. It won’t always be easy or what you want, but making the best of it will help in the long run. Know when it’s time to give something up or move it to the back burner, whether it’s a hobby, a book you’re never going to finish, or a love interest. Just because your Twitter account is protected, doesn’t mean people (read: future employers and companies) can’t still access them. They have ways of doing so. Call your family often when you’re away. Never underestimate the joy of an hour-long phone call with an old friend, especially if said phone call is unexpected. If you have time to eat a meal, you have time to talk to someone, respond to an email or a text message, or return a phone call. Be honest with people when you really don’t want to talk to them. See #16. Life isn’t meant to be fulfilled by the time you’re 22, 25, or even 30. If it were, we’d have nothing left to do or fulfill in our 30s, 40s, etc. Be patient and have faith that what’s meant to be will find a way. See this. Remember to breathe, and remember how blessed you are to be alive.